Deciding on which of the best pro makeup train cases to buy can be very confusing and can leave you feeling drained just looking at all of the reviews on the internet. I’ve saved you time by researching and reviewing the top 25 cosmetic train cases available online and have chosen the AW 2 in 1 Pro Makeup Case With Drawers as the best makeup train case available in 2018. You could easily get overwhelmed the variety of large and small carriers, caddies with lights, bags with mirrors, canisters with wheels, bins with lots of compartments, and holders with just a few. WHEW! That was exhausting just to type! Luckily, I’ve had the privilege of having first-hand experience with many different brands of cosmetic train cases including Caboodles, Yumi Kim, Sephora, Louis Vuitton and Victoria’s Secret. None of them are the best in my opinion. My top choice is made with very sturdy material and heavy duty plastic clasps. With plenty of room for even three sets of flannel sheets in the bottom according to another happy reviewer who bought it online. 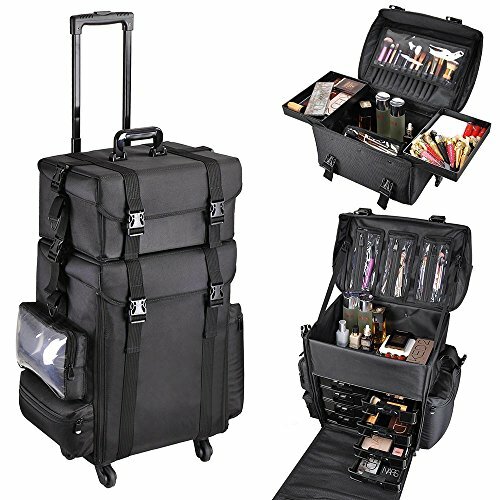 Professional 2 in1 Black Rolling Makeup Train Case with heavy duty retractable handle for added comfort and mobility. Bottom section contains 8 removable black plastic storage trays for small items such as lipsticks and nail polish bottles; Comes with removable 3 pcs brush holder; 2 storage compartment on two sides to hold other essentials accessories. 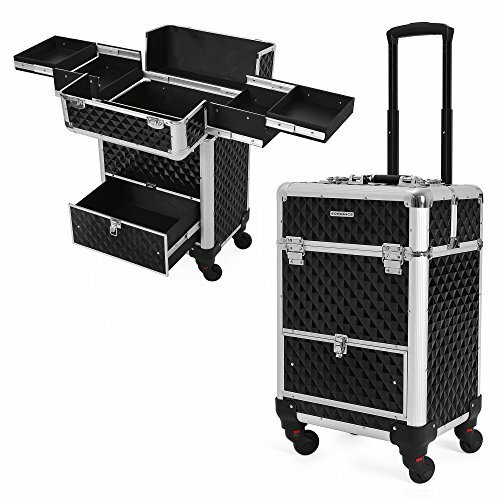 Top case overall (LxWxH):15" x 11 1/2" x 8"; Bottom case overall (LxWxH):15" x 11 1/2" x 17"
PRACTICAL & VERSATILE: This amazing trolley makeup case is a must-have piece for professional makeup artists, manicurists, hairstylists, beauticians, or those who possess a mountain of cosmetics. Also, it is an ideal present for your family and friends. PERFECT ORGANIZER: There are several dividers that can be placed in the retractable trays and middle removable storage, which help you arrange your cosmetics in a more organized and neat way. Large upper and bottom compartments with no dividers can store hair dryer, hair straighteners, sprays, brush bags and other items that are in relatively big size. 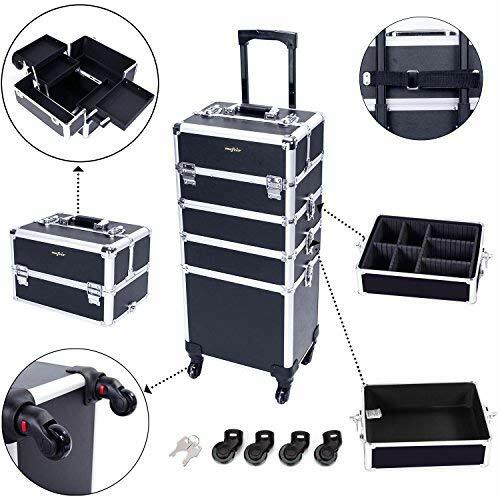 STURDY & SAFE: This fantastic makeup train case is constructed of top-grade plastic outer case, aluminum and metal reinforced edges and corners, and heavy duty metal hardware. Velvet lining protects the items from damaged during the trip. Four lockable clamps on the top and sides to guard your items, four keys are included. 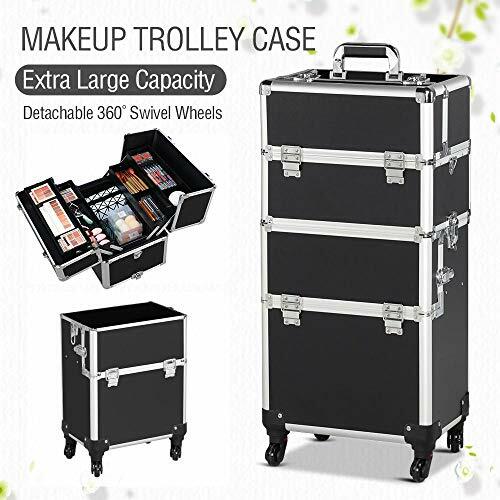 LARGE STORAGE SPACE: Large makeup train case with high load capacity up to 30 kg/ 66 lb is a perfect storage for a large number of hair tools, cosmetics and nail tools. ★ GREAT GIFT: Ideal birthday Valentine's Day Gift,SUITABLE for make up artist, hair stylist, nail salons or beauty center. HIGH QUALITY:top aluminum frame, reinforced steel corners,ABS Surface.Great for Hair Stylist Mother Wife Girlfriend Daughter. ★ ADVANCED :4pcs Durable Removable Wheels Rotate 360 Degree Easily install or remove.The handle ribbon is on the top part,pls make the ribbon around the handle tightly before travel. ★ LARGE SPACE :13.4"L x 9.8"W x 29"H,40"H w/Handle,Store all your beauty make up cosmetics of various like nail polishes, brushes, eye shadow etc. ★ MULTI-FUNCTION:4 optional styles can be used as a complete trolley, also be disassembled as a smaller train cases for your need. ★ 4 IN 1 DESIGNED:stylishly and lockable,Cosmetic trolley-upper top case and big bottom case,8 lockable keys to protect your privacy. AW International sells this amazingly durable makeup train case. The fabric is made out of 1680D nylon fabric. This is both water-resistant and wear-resistant. This caddy is very compact when not in use and has plenty of storage when assembled. The 4 wheels swivel easily in any direction when traveling through an airport or across town and are removable for storage making it one of the best cosmetic train cases. It has a heavy duty handle that will hold up for years and extends just like a suitcase. I am very impressed with how the designers of this one utilize all of the space for optimal storage. I also like that they have included 2 brush holders beneath the lids. These are detachable and hold 13 brushes! In the top compartment they have included two extendable trays and a large hollow space. This space is very large at 14 inches long, 10 ½ inches wide & 5 ¼ inches high. Large enough that you can pack a lunch of two foot-long sandwiches, two bags of chips, and two cookies from Subway. Most users like the detachable padded shoulder strap for when they only want to carry a piece of this trunck. I do like that the bottom 8 drawers completely come out and I can use pouches if I needed. I feel like the pouches would hold more nail polish or palettes when needed. Even with all of your beauty products placed in this bag, it still looks neat and organized. The Yaheetech 2-wheel 3-in-1 Professional Train Case comes in 3 colors: Black, Pink, & Silver. I’ll let you guess my favorite color of these. (hint: This color is all over my blog). I made this my number 2 pick because it is a hard one. I really had a hard time deciding whether I liked the hard or soft one, as above. Ultimately, for me, I wanted more portability and just felt like the soft carrier would be more comfortable to carry while traveling. However, this is a perfect chest for the value if you prefer a hard shell. The Yaheetech is made from Aluminum Alloy & PVC on the outside. The inside is lined with velvet. This is great for protecting brushes, nail polishes, lipstick & eyeliner pencils. This bin holds up to 66 pounds of anything you want to put in it. It stands 39 inches high, so you would have to check this with luggage if traveling by plane. The Yaheetech has very sturdy latches on it. Four of the latches are lockable and come with the keys. One reviewer on Amazon said she got a total of 10 keys with her order. So, be sure to keep some in a safe at home. If you are like me, you will eventually lose a key and will be frantically searching Google for “how to pick a lock” if you don’t have multiple keys. This chest is very organized with a removable middle; 4 retractable slide-out trays with 8 adjustable dividers. Overall, this is perfect for a beginner or professional. Cosmetologists nail techs, hairdressers, and cosmeticians would get lots of use out of this carrier. If you need a hard outer shell, then this will be the best makeup train case for you. Ok ladies, I’m a fan of the bigger train bags because I have so much professional and personal gear that I use, but I just HAD to make this one my number 3 overall pick. I love these bags so much because of lots of features that you just don’t find with other ones. The most notable is that this bag has a sewn in sleeve on the back of it that allows it to slip over my luggage handle to make this the perfect travel vanity case. Don’t you hate when you are traveling with your big cloth makeup bag and trying to balance that on top of your wheeled luggage? Well, this sleeve takes care of all of that! Now you can easily roll right through the airport all nice and tidy without your makeup bag falling every 5 seconds. This carrier comes in 3 different sizes and 3 different colors. Choose from small, medium, or large. Then, choose your favorite color of Black, PU Blue, or PU Pink. I promise I won’t know if you don’t pick pink. The Rownyeon makeup train bag has a plastic hard cover and oxford fabric which makes this bag waterproof. It comes with 10 adjustable dividers that make it shake proof. It has pockets built into the lid that holds plenty of brushes. And it also has a zipper sandwich that holds any and everything inside. Nothing ever falls out of this bag when opened or zipped! Multiple customers have commented on how they love this product and this company. The company has unparalleled customer service and will work with you quickly to resolve any issues you may have when purchasing this bag. There is a small smell from the glue that they use on the partitions. However, this is non-toxic and will be gone within a couple of days after purchase. I made the Songmics Rolling Trolley Train Case number 4 on my list because of the very sturdy design of this chest. This cabinet will hold up to 110 pounds! Now, I don’t know how you are going to get 110 pounds of makeup and accessories in here, but just know that the sturdy frame will support it. Made with a superior aluminum frame, reinforced steel corners, ABS surface, and MDF inner frame, you will feel the difference immediately in this one. You can also feel secure about knowing those high quality beauty products will not be stolen or damaged with 2 lockable clasps on the top and a buckle that prevents the drawer from sliding out. The four sliding trays are assembled with slide rails that easily allow you to access all of your items inside. The four 360-degree wheels allow you to easily maneuver this carrier over any surface. When you are done rolling this one, just take the wheels off and it will become very stable. This box is shorter than the others on my list at only 22 1/8th inches high. So, it takes up less space if you don’t have much of a working area. The telescoping handle seems to be better quality than most other models at this price. You can feel comfortable purchasing this product as it was highly recommended by customers who have bought it. Last, but definitely not least, on this list is this Meifer 4-in-1 Rolling Train Case. Remember, that I have researched, tested and reviewed 25 makeup train carriers and this one rounds out my top 5. This box also has a very strong design. It is made with heavy duty aluminum, ABS surface, and reinforced corners. It does have the 360-degree casters that make it easy to move around. The wheels are also removable. You can choose from my favorite color of pink or black. What makes this piece unique is that it has 4 separate compartments. So, it has plenty of space for all of your various cosmetics, shampoos, curling irons, and skin care products. Really, you could call this a vanity suitcase with all of the space it has in there. I did score this one a little lower than the others because only one of the middle sections had dividers. That is not a major problem for me though since I can just use that part to place bigger items in there. Or, you could easily find some replacement dividers to fill that one middle section with. I do prefer at least one sliding drawer on my makeup train bins and this one doesn’t have one. But, I do like the idea of being able to use all the sections separately. I also liked that this carrier comes with extra keys. It comes with 8 keys in total. This is very spacious and will hold any and everything you need it to hold. 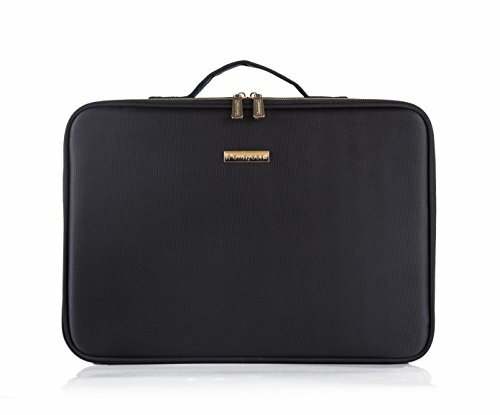 If you are a professional, you will like this makeup train case because it just looks professional. These also make great gift ideas for teens!